Amphiphilic co-networks are a new class of hydrogels that contain both hydrophobic and hydrophilic polymer chains in their structures. So, they have significant properties and great applications in tissue engineering, drug delivery systems, contact lenses, wound dressing, biosensor, and catalyst support. Various strategies have so been developed for the synthesis of amphiphilic co-network, such as ionic or free radical reaction of monomers, and chemical combination of prepolymers. Click combination between hydrophilic and hydrophobic prepolymers is one of the best methods because click reactions are fast, general, and high-yielded. 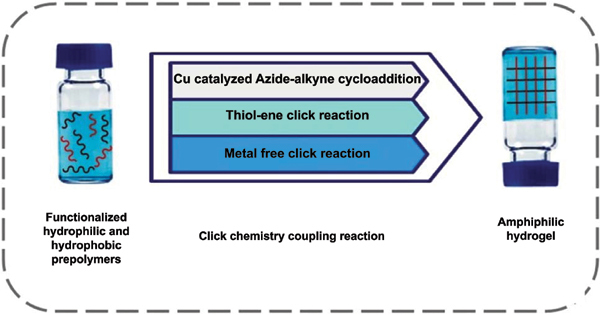 In this paper, we have focused on Cu catalyzed Azidealkyne cycloaddition and thiol-ene reactions because they were used more than other kind of click reactions in amphiphilic co-network synthesis. Additionally, suitable reagents and solvents have been discussed for each type of reactions and ultimately, physical properties of amphiphilic co-networks such as the degree of swelling in aqueous and organic solvents and proper applications of them have also been reviewed. Keywords: Amphiphilic co-networks, hydrogel, click chemistry, azide-alkyne cycloaddition, thiol-ene reaction. Keywords:Amphiphilic co-networks, hydrogel, click chemistry, azide-alkyne cycloaddition, thiol-ene reaction. Abstract:Amphiphilic co-networks are a new class of hydrogels that contain both hydrophobic and hydrophilic polymer chains in their structures. So, they have significant properties and great applications in tissue engineering, drug delivery systems, contact lenses, wound dressing, biosensor, and catalyst support. Various strategies have so been developed for the synthesis of amphiphilic co-network, such as ionic or free radical reaction of monomers, and chemical combination of prepolymers. Click combination between hydrophilic and hydrophobic prepolymers is one of the best methods because click reactions are fast, general, and high-yielded. In this paper, we have focused on Cu catalyzed Azidealkyne cycloaddition and thiol-ene reactions because they were used more than other kind of click reactions in amphiphilic co-network synthesis. Additionally, suitable reagents and solvents have been discussed for each type of reactions and ultimately, physical properties of amphiphilic co-networks such as the degree of swelling in aqueous and organic solvents and proper applications of them have also been reviewed.